This movie starring Kevin Bacon is based on a story by famed author Richard Matheson, whose other work includes “I Am Legend”, “The Box” and “What Dreams May Come”. Director David Koepp is better known as a screenwriter who has written numerous blockbusters like the Jurassic Park movies, Spider-Man, and Panic Room. 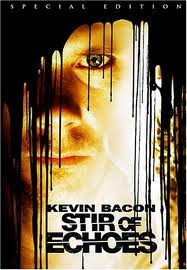 “Stir of Echoes” is a decent ghost story, but has its flaws. Set in suburban Chicago Bacon’s character of Tom is your average blue collar worker. One night at a neighborhood party he allows his sister-in-law to hypnotize him. This seems to open a door in his mind that allows him to be a “receiver” of the pleas of dead people. His son also seems to have this ability. In several scenes, the kid is talking to his friend Samantha who is nobody else can see. Samantha was a teenaged girl from the neighborhood who disappeared six months back. Little kids being used as a medium for the dead to air their grievances is getting to be a pretty tired plot device in my opinion. Tom starts to have visions and hallucinations of a horrific crime and is haunted by the ghost of Samantha. Tom goes back to his sister-in-law to if she can fix him. All he finds out is that he has to start digging in his backyard and buy large quantities of orange juice. Kevin Bacon, orange juice, there must be another breakfast reference somewhere I missed. Tom completely digs up the yard and apparently didn’t hit any gas or power lines. He is obsessively digging for the truth, yet his hands look fine. My hands would be a bloody mess after a half hour. He asks around the neighborhood and the police about Samantha’s case, but they brush him off. As is customary with most movies like this there is a scene where Tom has to go down into a dark and creepy basement, and an extremely tired use of a bathroom mirror gag. So does Samantha get her justice from beyond the grave? Are the neighbors harboring secrets? This movie is pretty formulaic in its story telling but it is pulled off well enough to be somewhat entertaining. The producer also thought so well of it that they made a direct to DVD sequel starring Rob Lowe.